What your hair can tell you about your health? A single strand of hair alone can reveal so much about you. Not only can it uncover your age, gender, and weight it can also tell you a lot about your health and habits both the good and the bad ones. #1. Dull and lifeless hair. Things like dying your hair frequently, using hot tools on a regular basis or a lack of moisture during the cold winter months can cause your hair to look dull and lifeless. However, your hair might lose its natural shine due to a vitamin deficiency. Based on a study conducted by Dr. Ahmad Ghorbani an assistant professor at the Gilan Agricultural And Natural Resources Research & Education Center, black lost your hair may indicate that your body needs selenium, sulfur, and phosphorus. Take a look at your gums and teeth as well to check if this is the cause, if you notice dental issues or other alarming changes then you should consult a doctor. Using too many hair products or not cleansing and exfoliating your scalp properly can lead to those annoying white flakes falling all over your shoulders and clothes. It may also have something to do with your current diet. Especially, if you recently cut back on fats and carbs. However, stress gastrointestinal issues and then immunodeficiency can be serious causes of dandruff. If you notice that the flakes are a bit yellow you may have Seborrheic Dermatitis. According to research conducted by the Department of Dermatology and cutaneous surgery at the University of Miami, this condition can be really hard to get rid off. So forget about anti-dandruff shampoos. The best thing you can do is to visit a hair and scalp specialist, to determine the cause and find a solution. #3. Thin and brittle hair. The condition of your skin, nails, and hair can worsen if you have a protein deficiency. Thin and brittle hair can be a big sign of that. Protein is an important nutrient that helps build and repair your body's tissues. It's recommended to eat more fruits and consume products rich in omega-3 fatty acids. They include shrimp, salmon, catfish, walnuts, and spinach. However, it could also be something way more serious. Researchers at Boston University's School of Medicine and the Rogers Williams Medical Center have found that brittle hair is a symptom of Cushing's disease. If you're afraid this might be the case. Watch out for other symptoms such as chronic insomnia, high blood pressure, and unexplainable back pain. And of course, check with your doctor for a proper diagnosis. 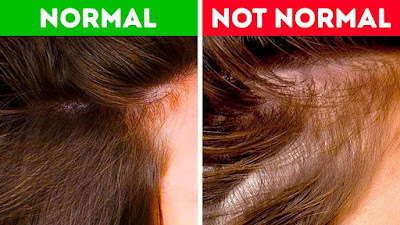 Dr. James C. Murata a leading hair restoration specialist based in New York says that losing around 100 strands of hair per day is totally normal. The easiest way to check for yourself is to run your fingers through your hair from root to tip, if everything is great there should be from zero to two strands on your fingers, if you see 3 to 5 strains you're fine too but if there's more than that then it's not a good sign. A study by the Department of Dermatology at the Medical University of Warsaw found that hair loss may be connected to problems with the endorphin or immune system. It can also be an indicator of diabetes. All of these are reasons enough to see your doctor as soon as possible. Don't panic though because it may be due to stress or a vitamin deficiency. We also tend to lose more hair as we age or during pregnancy. Still, only an expert will be able to tell for sure. Greasy hair usually indicates that you have an unhealthy diet. Award-winning hairstylist, Kasumi Kasai suggests eating less fatty meats. Greasy and fried foods dairy sweet stuff and refined carbohydrates to solve this problem. Also, avoid drinking too much alcohol and coffee. You can also calm those overactive sebaceous glands down by adding a few drops of tea tree oil to your shampoo. If these tips don't work greasy hair may indicate that you have metabolism problems, a hormone imbalance or liver issues. In this case, you have to visit your doctor to get professional advice. Graying hair mostly depends on a person's genetic predisposition. As you age the number of melanocytes responsible for pigment production decreases. Most people start seeing gray hairs pop up in their 30s or 40s. But there are also situations when young people and even teenagers go great. Premature graying is often a result of severe stress or chronic fatigue, according to women's health expert Dr. Jennifer wider. Another reason is a poor diet that doesn't include enough protein. Scientists are sure that these factors affect melanin production and that's why your hair may go great earlier than normal. If this symptom is accompanied by sores, pimples, paling flaky skin, or other sorts of skin irritation on your scalp. Then it's a sign that something's really wrong only a dermatologist or hair and scalp expert can tell you whether or not it's psoriasis or eczema. If the itching isn't accompanied by skin irritation it may be the result of a nervous system disorder caused by stress. It could be somewhat like a compulsive ick, Not unlike nail-biting! In this case, it's recommended to drink soothing herbs and consume more foods with vitamins B1 and B6. Seeing a mental health expert is also a must. #8. Dry hair and split end. Besides all the obvious stuff like bleaching, firming, and using hot tools such as curling irons, straighteners, and blow dryers your hair gets dry because of a lack of protein, iron, and copper. At least, that's what experts at the Trichomed clinic for her medicine and hair transplantation in Germany have found in their research, Dry hair and split ends caused by a mineral deficiency are common among people who follow strict diets as well as those who have issues with their endocrine system. Make sure you're following a nutritionally balanced diet that provides your body with all the good stuff it needs like protein and iron. Including fish carrots and orange juice in your menu from time to time is advisable especially since orange juice contributes the better iron absorption. Don't forget to drink enough water to avoid dehydration and please check with a doctor to make sure your dry damaged hair isn't a sign of something serious. And finally, remember that your hair only tells a tiny part of the story when it comes to your overall well-being. That is it's not a litmus test for health and you shouldn't diagnose yourself by checking the condition of your hair alone. If you experience any health problems should always consult the doctor first. What are the most common struggles you have with your hair? Whether it's constant shedding or flat as a pancake sound off in the comments.